mediAvatar iPad Transfer can easily export iPad/iPhone songs, videos, podcast, photos and TV program to local disk, and import files on PC to iPad/iPhone. With its management panel, you can manage and transfer all your files between iPad and PC, and use iPad like a portable hard disk. All iPad types are supported. mediAvatar iPad Transfer supports iTunes 9.2 and iOS4 now! 3.Added the function of displaying DVD chapters under the node of Rip DVD/CD. 4.Improved user experience with neater interface, smoother drag-and-drop operation and faster creation of a new Playlist. 1. Support connecting multiple iPads and iPhone at the same time in order to transfer files between them at ease. And with this iPad transfer, you can manage iPad as a hard disk and take full advantage of it. 2. All iPad types are supported in this iPad copy software. 3. 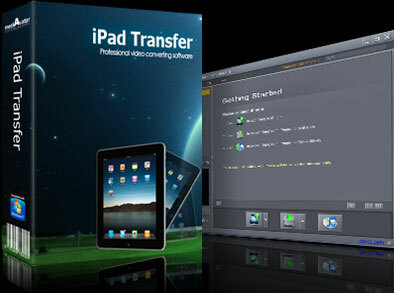 With this iPad transfer software installed on your iPad, transferring files between iPad and computer can be done on any computer. 4. Great iPad playlist management functions available for you to create, edit and delete playlists with ease. Qweas is providing links to mediAvatar iPad Transfer 4.2.1.0526 as a courtesy, and makes no representations regarding mediAvatar iPad Transfer or any other applications or any information related thereto. Any questions, complaints or claims regarding this application mediAvatar iPad Transfer 4.2.1.0526 must be directed to the appropriate software vendor. You may click the publisher link of mediAvatar iPad Transfer on the top of this page to get more details about the vendor.